So I plan on using cloth diapers when this little one comes. For those unfamiliar with cloth diapering, there are many different ways to cloth diaper (CD). The cheapest option is to use prefolds with a waterproof cover, which is what babies have worn for hundreds of years (and what my mom was thinking about last night when she asked if my baby was going to wear plastic pants). The easiest options are All-In-Ones or Pocket diapers, where the outer layer is waterproof. These are pretty much just like a disposable diaper, except they are cloth and don't have all of the dangerous chemicals that 'sposies have. Here is an easy chart comparing the different kinds of CD. I'm sort of praying for a really generous relative who decides they want to buy me a big stash of pocket and AIO diapers, but in case that doesn't happen, I'm starting to consider other options. Sewing my own sounds like a good plan, doesn't it? I've found a couple of links to some sewing patterns and was hoping to hear from some people out there on the interwebs about diaper sewing patterns that you have really loved. The first one I've heard great reviews about is Mama Bird's Free Diaper Pattern. She has a basic diaper pattern and instructions on making it an AIO, fitted, or pocket. Fern and Faerie has a ton of instructions for making prefolds, wool covers, flatfolds, fitteds, and for knitting wool soakers! 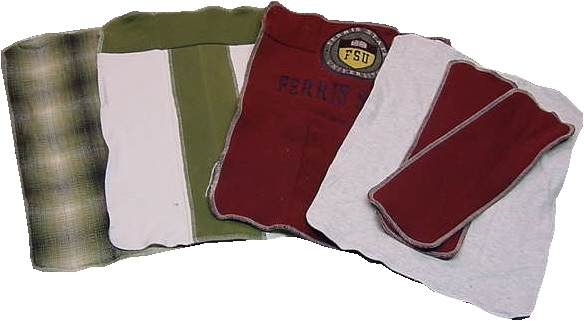 This website is geared toward frugal diaper sewing, so most of the instructions are for how to turn old t-shirts, flannel shirts, or wool sweaters into diapers. Please let me know what works for you! I sewed my own CD's for my DD. I bought the VeryBaby pattern and used that for quite some time... then I made some significant adjustments to the shape to get the best fit for her body (chunky little thighs and a teensy weensy waist). I tweaked the sewing method a bit too and I best liked my self-made pattern in the end. For materials, I love PUL on the outside (waterproof polyurethane laminated fabric) and you can buy it from diaper fabric shops online or also from some coops (check Yahoo groups, etc) which provide a bigger variety of prints, but a much slower wait between ordering and receiving. I bought a TON of cotton diaper twill in bulk and never used it all, so every single absorbant core I ever made was with that fabric; but whenever I have another LO I will probably branch out and try some new stuff. I used cotton twill, cotton flannel, and microfleece all at different times for the body layers. The microfleece is NOT a natural fiber, but it's soft and the texture means bowel movements shake off VERY easily and with no swishing (ewww). The flannel is nearly as good for shaking, comes in pretty colors, and is a natural fiber. PRESHRINK your cotton flannel or you will get weird problems with the fit after a couple of washes! For PUL and for diaper elastic I was happiest buying from a diaper fabric store online (for ease of shopping and consistant quality). For absorbant and body layers, go with fabrics you like wherever you can get them most affordably. Oooooh - closures!! I like hook-and-loop tape best - most commonly called Velcro but I actually liked the Aplix brand better; it seemed to hold up better in the wash. If you decide to go with snaps, go ahead and invest in an industrial snap press. The little hammer-them-on ones from JoAnn's WILL fall off in your washing machine. They just aren't intended to go through so many layers of fabric. Thanks! So much healthier for the baby, too. Thanks! What a eco-friendly product. I am wishy washy about cloth diapers. I love them and I hate them. I tried using them with my youngest when he was just a couple months old. After many leakage problems, especially at night, we went back to disposables. Just recently, I have returned to the cloth diapers (trying to be economical). I did a lot of research this time around and realized the leakage issues were due to how I was washing them. I used detergent and fabric softener which is a big No-No when it comes to cloth diapers (I had no idea). Now I wash them only in 1/2 cup of white distilled vinegar and hang them out on the clothesline to dry. Hard to believe, but they get clean and smell fresh. Right now, I am using the old fashioned Gerber pre-folds with the vinyl pants like my mom used. If I was rich, I would use the AIO's, but even on eBay they sell for a astronomical amount. I sewed some cloth diapers last year (now they're too small) that had velcro closures ands elastic gussets to prevent leak and hold stuff in, but the vinyl pants were still needed. I would like to try to sew an AIO, but can't find the PUL fabric anywhere, I am skeptical about trying wool, even though I have heard good things. My "baby" will be 2 in October and is starting to show interest in the "big potty", so I guess we'll just stick with the old fashioned pins and pants until then. :) Have a great day! I purchased "used" BumGenius One Size AIO for $5. The were returned items that had minor (if any imperfections). They did not come with liners so I will be making some out of microfiber. Just keep checking the clearance section because when the have them the go fast.